The moment I walk into one, I’m transported from a suburban parking lot or fluorescent-lit mall into the warm embrace of a French country kitchen. There is a line from Truman Capote’s 1958 novella Breakfast at Tiffany’s that has always resonated with me. It’s the one where Holly Golightly describes the calmative effect the Manhattan jewelry store has on her—it feels like the kind of place where “nothing very bad could happen to you.” I get where she’s coming from. Tiffany’s encloses you in a world of civility and comfort and riches—the carpets are soft against your city-worn shoes; the cosseting staff pampers you in the way adults aren’t supposed to be pampered, even though it’s all we want. It’s a place that buys you something unexplainable, even if you’re only window shopping. It’s the exact same way I feel about Williams Sonoma. The moment I walk into one, I’m transported from a suburban parking lot or fluorescent-lit mall into the warm embrace of a French country kitchen. There are shiny copper pots and rustic farmhouse tables, red tins filled with peppermint sticks and plates the color of the Tuscan sun. I’ve felt that way ever since the first time I stepped into a Williams Sonoma in the early 1990s. I was shopping with my mother at a Cincinnati mall. We walked slowly together past shelves of elite Italian espresso machines and pots that gleamed like museum pieces. Looking at the price tags, I could see Mom’s eyebrows rise, hear the occasional, “Mmm, mmm, mmm,” humming through her pursed lips. Despite its higher-than-expected price points, the store soon became a regular destination for us. While she would splurge on the occasional German knife or decorative ceramic rooster, we usually walked away with less extravagant purchases—some dish towels or a tiny sack of flat, rectangular, wafer-like sponges that puffed up when you ran them under water. It didn’t matter. We just liked taking a little Williams Sonoma home with us. There was something about Williams Sonoma that made me feel like life could be better. Being there made me feel like I inhabited a shiny-happy Nora Ephron film instead of the drab, Slacker-era Linklater one in which I lived. My father had died suddenly a year before, my girlfriend was cheating on me, and I spent most of my time smoking pot in a bedroom strewn with Love and Rockets posters. But behind Williams Sonoma’s plateglass doors, things were civilized and warm and tranquil. In college, I took a job at Williams Sonoma during a holiday break—one I came back to for the next two seasons. I worked in the stockroom, which wasn’t the same as working on the floor. While the aproned employees who interacted with shoppers were expected to know the difference between, say, Calphalon and Le Creuset, all we had to do was unpack and break down boxes, check off the shipping manifests, and slap on price tags. We smoked in the back hallway. We made fun of the little crocks of herbes de Provence. But that started to change for me when I pocketed a damaged one after my shift one night and tossed the dried herb blend into some scrambled eggs. Up until then, the only spices I kept in my kitchen were salt, pepper, and an enormous plastic container of oregano. But just opening the jar and smelling the combination of thyme, basil, fennel, and lavender made my mouth water as if a whole roast chicken had been placed in front of me. During my second season working there, the stockroom manager won the lottery and quit his job to follow the Rolling Stones, leaving me in charge. I hired my high school friend Andy to help out. We caught hell for letting the holiday shipments pile up as we sat on the gift-wrapping table talking about R.E.M. and writing poems for Annie and Beth, saleswomen we had crushes on. Eventually I started dating Beth, and Andy started seeing a saleswoman named Mary. We gathered to drink wine after work; we started having dinner parties. A community was forming. I remember how on a cold winter night a teacher named Nancy, who worked at Williams Sonoma between semesters, invited a few of us to her Tudor-style house. She and her daughter made risotto, a dish I’d never heard of before that night. In a way, our Williams Sonoma was becoming exactly what Chuck Williams intended—a place where people could gather to form friendships and learn about cooking. And while we were a far cry from the luminaries who flocked to his first San Francisco store—a favorite haunt of Julia Child, James Beard, Craig Claiborne, and Elizabeth David—we, too, were learning lessons about why olive oil was so much better than vegetable oil, why a stand mixer was worth the money, why a pizza stone could make your Boboli so much better than a plain old baking pan. 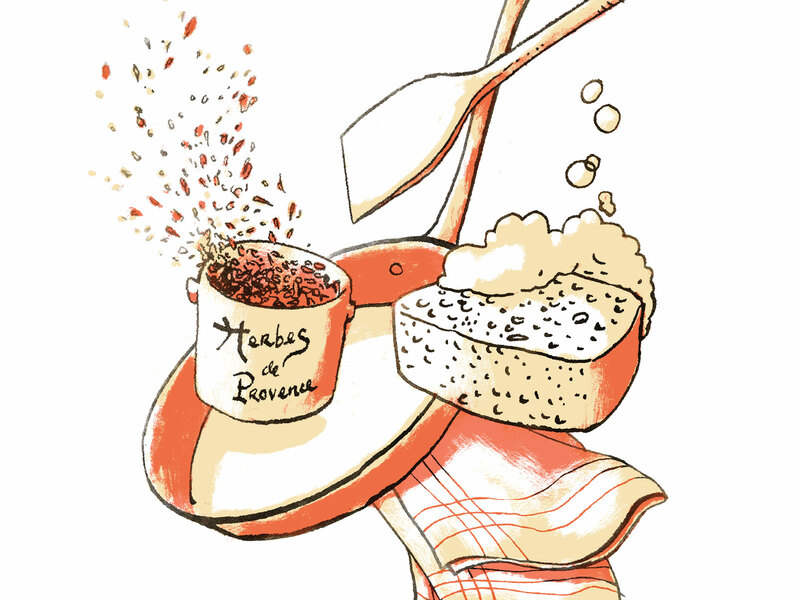 We were learning something more lasting and valuable, too: how to love cooking. A quarter century has passed since I worked at Williams Sonoma. I live in New York now, where I eventually combined the two things I love best—cooking and writing—into a career. I still go into Williams Sonoma whenever I find one. Even if I just pick up a wooden spatula, or some herbes de Provence, it reminds me of why I fell in love with cooking in the first place. And I just like being there. I ducked into a Williams Sonoma just last month because it seemed like a good antidote to how I was feeling that day. For the past week, I’d been at a nearby hospital visiting a sick friend who wasn’t going to get better. And before I made the long drive back home to Brooklyn, I needed a little bit of comfort, a reminder of that perfect world Chuck Williams created for all of us back in Sonoma all those years ago. Inside, I saw a class of school-aged kids learning how to make breakfast. The smell of maple bacon wafted through the air. I passed by the shiny copper cookware, picked up a frying pan, and flipped it around in my hand like a professional chef. As the woman behind the counter rang up a box of Oregon sea salt for me, I told her that I used to work at Williams Sonoma. “We’re hiring,” she said. “Want to work here again?” I thought about my sick friend, the perils of adulthood, and the imperfect world that waited outside those heavy glass doors. I laughed a little and signed my name on the credit card receipt. I didn’t tell her that I actually do. 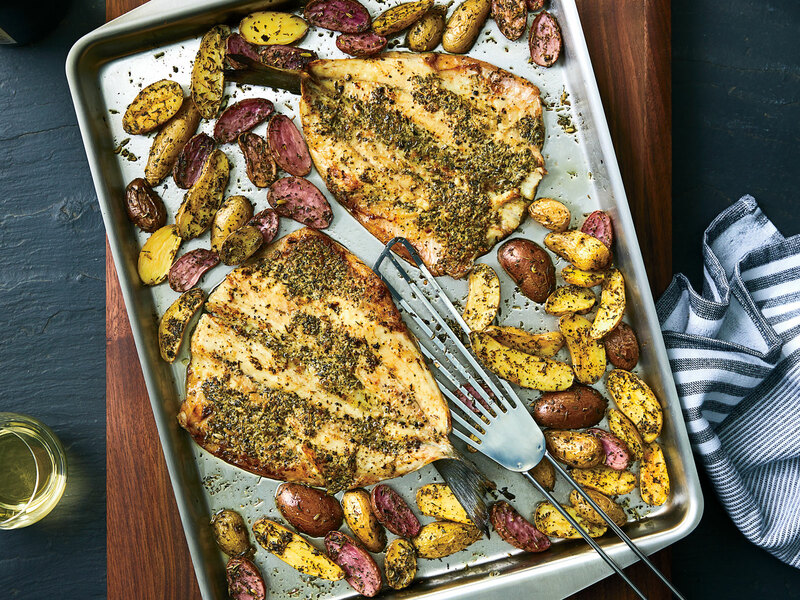 Get the recipe for Herbes de Provance-Crusted Branzino and Fingerlings.